Bye Bye Myelin. My life with MS and all the other stuff. : Litter-bugged! At the risk of turning into Esther Rantzen (but with smaller teeth) I am about to get on my soapbox. Turning 40 has officially allowed me to indulge the grumpy old woman aspects of my character that have been lurking beneath the surface for many a year. If you don’t like a rant, then I suggest you stop reading. This post has nothing to do with MS, hair, diets, exercise, chickens or my family. There was no roll of carpet in my litter dump. Today was the kind of February day that makes you happy to be alive. The first signs of Spring were everywhere: birds singing, snowdrops bobbing in the breeze and glorious sunshine that gives hope that the dreariness of winter is almost over. I decided to get out on my bike to make the most of it and was glorying in snow-capped mountain views and the sparkling bay vista when something caught my eye. That something was a Tesco carrier bag which had been unceremoniously dumped by the side of the road. On closer inspection I discovered it contained the following: the wrappings of a McDonalds Value Meal, an empty tube of Jaffa cakes, a bottle of Lucozade Sport and an empty packet of 20 Lambert & Butler. Now to some people this might sound like the ingredients for a good night out (and to be honest I am a Jaffa Cake fan) but it really, really upset me that someone could not see what I could see; a beautiful view, the wonder of nature laid out right in from of them. That all this gorgeousness didn't make them care enough to not want to ruin it by dumping their rubbish right in the middle of it. So I did what any woman on a bike 5 miles from home would do. I picked it all up (they had thoughtfully left the Tesco carrier bag) and rode home with it swinging from my handlebars. When I was a student in Newcastle there was a man who used to shuffle round the streets of Jesmond with a plastic bag, picking up bits of litter morning, noon and night. We rather unimaginatively called him the “Carrier Bag Man” and I remember thinking he had some kind of mental health issues. Twenty years on and I am fully aware that I am now turning into “Carrier Bag Woman”. My actions on the bike ride today are not unprecedented. Family walks regularly become litter picks simply because I cannot bear the thought that places of beauty, which can give so much pleasure, are blighted by the lazy actions of some unthinking consumer of junk food, caffeine and crap fags. I am reliably informed by my husband that the only litter that existed in the pre-junk food days of the seventies and early eighties was the odd top-shelf magazine tossed away (excuse the pun) in the hedgerows, litter which at least provided a valuable educational resource to the nation’s pubescent boys. It is surely no coincidence that the 500% rise in litter since the 1960s (according to Keep Britain Tidy) is matched by the explosion in the availability of junk food. 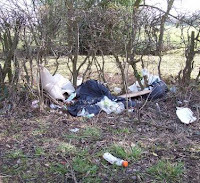 Litter is symptomatic of a careless, convenience-driven, throw-away culture. The same people who are careless about their health (fags, sports drinks, take-away food) clearly have the same reckless approach to their environment. Someone else will pick up the pieces (NHS in the case of their health, middle-aged mother-of-three with a mild case of OCD, in the case of the litter). 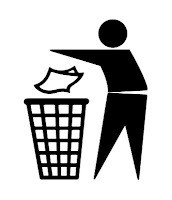 The American Author Bill Bryson who famously loves his adopted UK puts it quite succinctly: "Most people litter guiltily and stealthily, their desire not to have a piece of rubbish with them is now greater than their commitment to society. We need to appeal to people's conscience and say to them, "This is a beautiful country, stop trashing it." Good old Bill is also an advocate of picking up litter when we see it. You see, I am not mad – Bill Bryson is in my camp! Mayor of London Boris Johnson advocates tackling litter louts head on (and yes, I appreciate the irony of using Boris Johnson as proof of my mental stability). I have tried the friendly confrontation approach with a group of 15 year old girls who chucked an empty can of coke on the pavement right in front of me. It was a bit scary to be honest, they gave me a bit of lip but they did pick it up and ultimately I am glad I acted, because that is what being part of a community is about. We need to educate our children and not be afraid of confronting people when they get it wrong. In the meantime I am proud to be my town’s very own “Carrier Bag lady” because I love where I live and I want my kids to be able to appreciate the beauty of their surroundings without a KFC wrapper getting in the way. Love your post! I have to credit my sister with the idea of taking "trash walks." I used to live in a sketchy neighborhood that was really appalling in terms of litter, and it was gratifying (if gross) to walk around with our garbage bags and pick up trash. Bravo for confronting the teenage girls. Teenagers are so intimidating! To think I used to be one...many, MANY years ago.